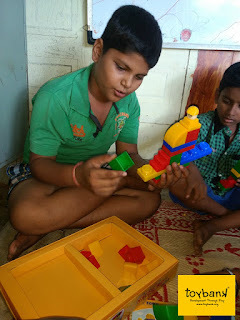 Arya and Garima are 2 young Toybankers that have done some beautiful volunteering work in September 2012. Below are details of what they did, also written by them. First of all, we would like to introduce ourselves. 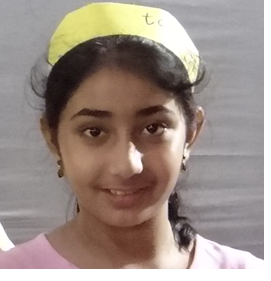 We are two friends - Arya Menon aged 10 and Garima Merani aged 11 staying in Chembur. We go to Avalon Heights International School at Vashi. 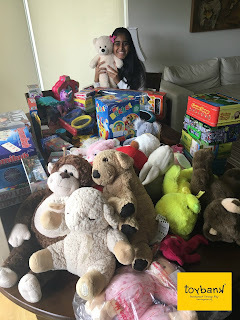 We became Toybankers a couple of years back when our parents started volunteering for Toybank. We had helped them during the toy donation drive in our society and later in our school. This year, during the Ganpati festival a fun fair was planned in our society where people could put up their own stalls. It was the first time this was being done in the society, so all of us were very excited about it. We also wanted to put up a stall all by ourselves. When we told this to our parents, they suggested that we could make something and sell it. We had heard about some children helping Toybank by making cards etc, so we thought we could also do that. But we thought we should make many more things and so we decided to make bookmarks, magnets, envelopes and cookies in addition to cards. Both of us didn’t know how to make envelopes, so Arya’s mom helped us with that cutting and sticking the envelopes. We decorated these envelopes with cute pictures of little children playing and some other nice designs. Garima’s mom helped us with the chocolate cookies. We loved making the bookmarks for kids with interesting messages related to books like ‘ Readers make leaders’, ‘I am a book worm’ etc . We made separate bookmarks for adults using pictures from magazines. The fridge magnets were also fun to make with nice messages like “Daddy’s lil’ girl”, “Mommy’s lil’ boy!”, “My father’s a Superman” etc. The funny part was we decided to make these magnets just the evening before the event! We both took more than a week to do all this work. We were lucky to have had holidays for five days during this time, so we used that time to make these things. We then decided the prices for these items and Arya’s mom helped us to make a rate card. We sold bookmarks for Rs.20, envelopes for Rs.15 and Rs 20, magnets for Rs 25 and cookies for Rs.15and Rs.20. We felt very good that we were made something for Toybank, all by ourselves. We decorated our stall by covering the table with yellow chart paper and some stickers. In the beginning, nobody was coming to our stall ,so we told some of our friends to tell people to come to our stall. Then everyone started coming. All the people who came were amazed that we both could do make such nice things! We felt we did a very good job because by the time we fun fair got over not a single thing was left and we had collected Rs.2400. Everyone was happy that we were donating the money for Toybank who would use it to buy toys for children who don’t have them. We want to do the same thing next year also and collect more money for Toybank by making and selling many more beautiful things.